Let’s talk Botox, do we like it or not? Are you afraid of needles or just can’t get enough? Did you know you can get the same effect without needles? For myself as a massage therapist, I find that I enjoy the look after and the idea of having muscle/skin firmness instead of lines and wrinkles. 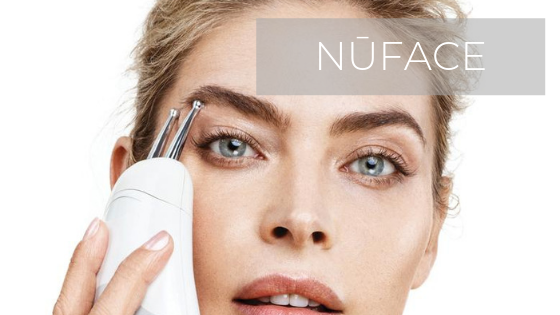 Easiest way is with your own self held NŪFace facial device. If you look at the cheekbone, forehead, temples and jawline of someone younger, their features are very defined. Around the age of 40 to mid-50’s, the convexity of the features tend to go flat. From 60 and up, muscles and collagen levels start to significantly decrease. Since the trend in the beauty is to be/look younger, try tightening the muscles of the face rather than injecting product into the muscle. I recognize the idea of using micro-current to stimulate the muscles sounds both high-tech and alarming. But in truth, it has been in practice for hundreds of years. Professional athletes and anyone who has been through physical therapy have often experienced an electrostimulation machine, as orthopedists routinely prescribe micro-current to aid in the repair of ligaments and muscles. The NŪFace device is a perfect at-home treatment you can perform in the comfort your own bed or couch. This treatment is also available at our spa!